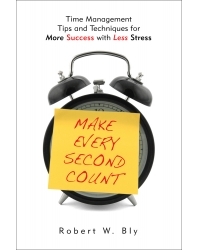 Make Every Second Count goes beyond the usual time-management books to bring you a broad range of strategies and tactics-dozens of proven methods to get more done in less time. technology can enable you to manage information and communicate more effectively and efficiently. • How to eliminate bad habits and unnecessary activities that slow you down. • The painless way to handle paperwork. • How to master the art of saying no. • The three types of to-do lists every person should keep.